KARACHI, Pakistan (AP) — Pakistan is secretly racing to develop its own armed drones, frustrated with U.S. refusals to provide the aircraft, but is struggling in its initial tests with a lack of precision munitions and advanced targeting technology. One of Islamabad's closest allies and Washington's biggest rivals, China, has offered to help by selling Pakistan armed drones it developed. But industry experts say there is still uncertainty about the capabilities of the Chinese aircraft. The development of unmanned combat aircraft is especially sensitive in Pakistan because of the widespread unpopularity of the hundreds of U.S. drone strikes against Taliban and al-Qaida militants in the country's rugged tribal region bordering Afghanistan. The Pakistani government denounces the CIA strikes as a violation of the country's sovereignty, though senior civilian and military leaders are known to have supported at least some of the attacks in the past. Pakistani officials also call the strikes unproductive, saying they kill many civilians and fuel anger that helps militants recruit additional fighters — allegations denied by the U.S.
Pakistan has demanded the U.S. provide it with armed drones, claiming it could more effectively carry out attacks against militants. Washington has refused because of the sensitive nature of the technology and doubts that Pakistan would reliably target U.S. enemies. The U.S. has held talks with Pakistan about providing unarmed surveillance drones, but Islamabad already has several types of these aircraft in operation, and the discussions have gone nowhere. Inaugurating a defense exhibition in the southern city of Karachi last week, Pakistani Prime Minister Raja Pervaiz Ashraf indicated Islamabad would look for help from Beijing in response to U.S. intransigence. "Pakistan can also benefit from China in defense collaboration, offsetting the undeclared technological apartheid," said Ashraf. Pakistan has also been working to develop armed drones on its own, said Pakistani military officials and civilians involved in the domestic drone industry, all of whom spoke on condition of anonymity because of the classified nature of the work. Pakistan first began weapons tests seven or eight months ago with the Falco, an Italian drone used by the Pakistani air force for surveillance that has been modified to carry rockets, said a civilian with knowledge of the secret program. The military is also conducting similar tests with the country's newest drone, the Shahpur, he said. An unarmed version of the Shahpur was unveiled for the first time at the Karachi exhibition. The weapons tests have been limited to a handful of aircraft, and no strikes have been carried out in combat, said the civilian. Pakistan lacks laser-guided missiles like the Hellfire used on U.S. Predator and Reaper drones and the advanced targeting system that goes with it, so the military has been using unguided rockets that are much less accurate. While Hellfire missiles are said to have pinpoint accuracy, the rockets used by Pakistan have a margin of error of about 30 meters (100 feet) at best, and an unexpected gust of wind could take them 300 meters (1,000 feet) from their intended target, said the civilian. Even if Pakistan possessed Hellfires and the guidance system to use them, the missile's weight and drag would be a challenge for the small drones produced by the country. Pakistan's largest drone, the Shahpur, has a wingspan of about seven meters (22 feet) and can carry 50 kilograms (110 pounds). The U.S. Predator, which can be equipped with two Hellfire missiles, has a wingspan more than twice that and a payload capacity over four times as great. Pakistani drones also have much more limited range than those produced in the U.S. because they are operated based on "line of sight" using radio waves, rather than military satellites. The Shahpur has a maximum range of 250 kilometers (150 miles), while the Predator can fly over five times that distance. The British newspaper The Guardian reported Tuesday that Pakistan was working on an armed drone but did not provide details. 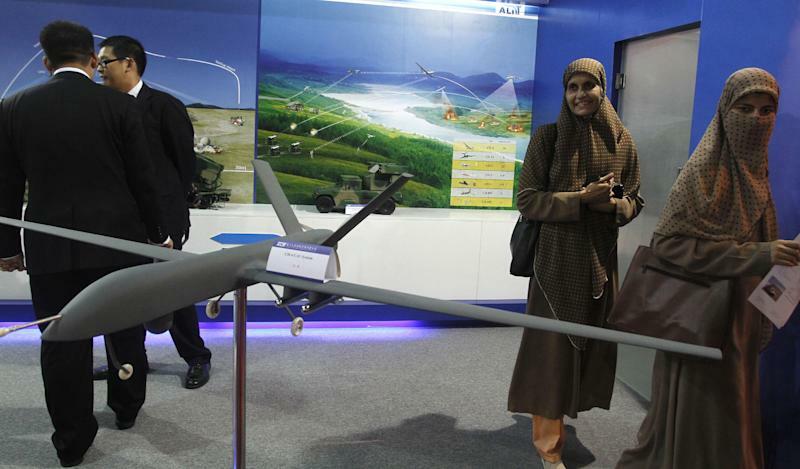 The market for drones has exploded in Pakistan and other countries around the world in recent years, as shown by the array of aircraft on display at the defense exhibition in Karachi. Hoping to tap into a worldwide market worth billions of dollars a year, public and private companies wheeled out over a dozen drones that ranged in size from hand-held models meant to be carried in a backpack to larger aircraft like the Shahpur. All the Pakistani drones on display were advertised as unarmed and meant for surveillance only. One private company, Integrated Dynamics, even promotes its aircraft under the slogan "Drones for Peace." But several models developed by the Chinese government were marketed as capable of carrying precision missiles and bombs. 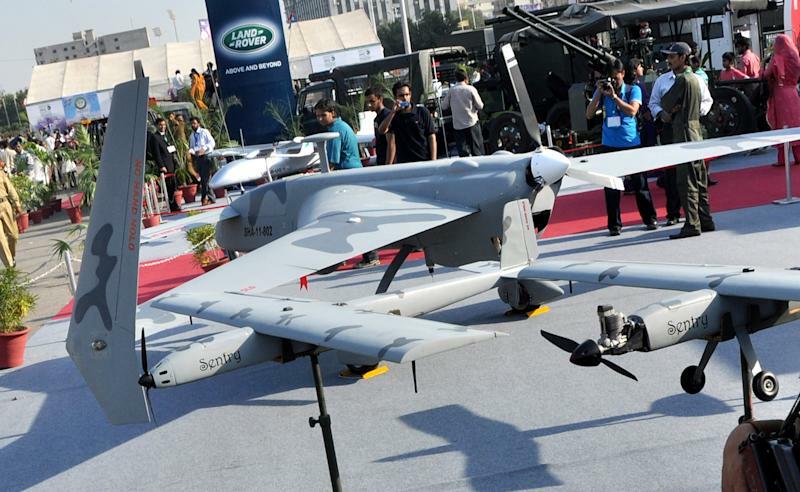 The Chinese government has offered to sell Pakistan an armed drone it has produced, the CH-3, which can carry two laser-guided missiles or bombs, industry insiders said. Also being offered to Pakistan is a more advanced drone, the CH-4, which closely resembles a U.S. Reaper and can carry four laser-guided missiles or bombs, according to Li Xiaoli, a representative of the Chinese state-owned company that produces both the CH-3 and CH-4, Aerospace Long-march International Trade Co., Ltd.
Pakistan has yet to purchase any armed Chinese drones because their capabilities have yet to be proven, but is likely to do so in the future, said the civilian with knowledge of the Pakistani military's drone program. Only a few countries, including the U.S., Britain and Israel, are known to have actually used armed drones in military operations. "China is a bit of a tough nut to crack as you'd expect," said Huw Williams, a drone expert at Jane's International Defense Review. "They frequently wheel out exciting looking aircraft but are yet to really demonstrate anything earthshattering."